French is taught as a second foreign language (subsequent to the partner tongue English or German) starting in grade 7. So far, all D1 and D2 students need to take French. Since 2014, Spanish has also been offered as an option for the second foreign language. In order to fulfill the Abitur requirement, students have to take their second foreign language at least up to the end of grade 10 with four hours per week in grade 7 and 8 and three hours in grade 9 and 10. • can understand the main points of clear standard input on familiar matters regularly encountered in school, leisure, etc. • can deal with most situations likely to arise while travelling in an area where the language is spoken. • can produce simple connected texts on topics which are familiar or of personal interest. After grade 10, students can continue learning French in a Grundkurs with 3 hours per week or a Leistungskurs with 5 hours. Both courses are part of the Abitur as well as of the Diploma program and also prepare for the AP exam. They are recognized as AP honors courses. Students can take a one-year-Grundkurs and stop French after grade 11, but they also can continue until the end of grade 12. The Leistungskurs is a core part of the Abitur program and includes grade 11 and grade 12, but is also an option for Diploma students striving for excellence in French. • can understand the main ideas of complex texts on both concrete and abstract topics, including technical discussions in his/her field of specialization. 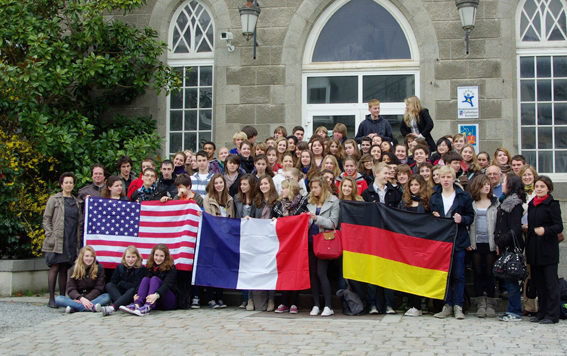 • Class exchange programs in grade 9 with our partner schools in Sèvres (Paris), Saint-Brieuc and Perpignan. Around 60 students participate in these programs every year. • The individual exchange program “Brigitte Sauzay” for a very limited number of students in grade 10 with our partner school in Saint-Brieuc. JFK students spend 8 weeks in January/February in our partner school and host their exchange partners in May/June. • Leistungskurs trips to Paris, Brussels or Nice on a yearly basis. • Participation in national foreign language competitions where our students often win awards. • Organization of the French night (Soirée française) on a yearly basis. • Numerous field trips to events in Berlin related to francophone culture. • Early French activities in grade 6 of the Elementary school. The French Department is also very active in the field of teacher training. It hosts a student teacher seminar (Fachseminar) for French and cooperates with the Institute for Romance languages of the Freie Universität Berlin. Generally speaking, the Abitur and AP results of JFK students who take these exams in French are excellent.